The Paranormal World is Alive (and dead) in the far west Boonies of Chicago! 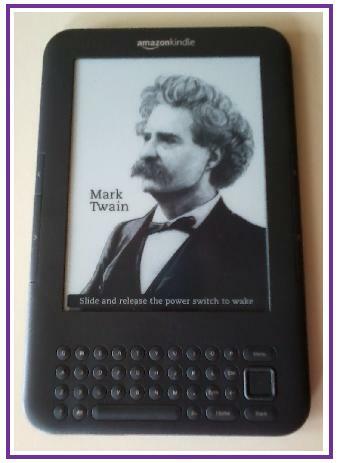 I recently found Mark Twain IN my Kindle and through a glitch of sorts contacted his spirit. I took advantage of this phenomena and asked him for writing advice. We got off to a rocky start but worked it out. I do wonder why he felt entitled to be so uppity. I may be a lowly unpublished writer, but Mr. Classic Writer had to recycle his famous quotes to answer every one of my questions. I guess even ghosts put on airs-or should I call it it vapors? Mrs. LeRosier: I think I could finally finish my books if life’s obligations would leave me alone and people wouldn’t call me when I’m writing. How did you cope with this issue? Mr. Twain: Nothing so needs reforming as other people’s habits. Mrs. LeRosier: I’ve studied a few models for plot structure but each one is touted as the only viable way to write. Which one should I use? Mr. Twain: Ideally a book would have no order to it, and the reader would have to discover his own. Mrs. LeRosier: I spend a great deal of research time for my novels. Is research a wasting time for a fiction writer, especially for Urban Fantasy? Mr. Twain: Get your facts first, then you can distort them as you please. Mrs. LeRosier: My novel Illuminated Rifts has characters that are loosely based on real people, family and friends. Is this a bad idea? Mr. Twain: Don’t tell fish stories where the people know you; but particularly, don’t tell them where they know the fish. Mrs. LeRosier: I find writing fantasy more difficult since I have to ground the fantastical to make it plausible enough for readers to suspend disbelief. Any thoughts? Mr.Twain: It’s no wonder that truth is stranger than fiction. Fiction has to make sense. Mrs. LeRosier: Spelling is my weakest writing skill, fortunately I write in the age of spell check. Was spelling a problem in your writing and time? Mr. Twain: I don’t give a damn for a man that can only spell a word one way. 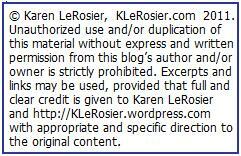 Mrs. LeRosier: I believe self-publishing will give me the greatest odds of success with my books, any advise? Mr. Twain: All you need is ignorance and confidence and the success is sure. Mrs. LeRosier: “Show-Don’t tell” is probably the most common advise given to new writers. (Don’t tell the reader the character is angry, show them through actions and description of body language.) What say you? Mr. Twain: Words are only painted fire; a look is the fire itself. Mrs. LeRosier: Illuminated Rifts, an Urban Fantasy, and Geocaught, A Romance are my current WIPs (works in progress.) Some friends and family say books in these genres are not real literature, can never become a classic. Is this true? Mr. Twain: Classic:A book which people praise and don’t read. Note: I mentioned that many Mark Twain novels are considered classics and he muttered something that sounded like, they weren’t when it counted. Mrs. LeRosier: I’m over 50 years old and some people think becoming an author at this age is a pipe dream. Mr. Twain: Don’t part with your illusions. When they are gone, you may still exist, but you have ceased to live. Hope you enjoyed Mr. Twain’s words of wisdom. Thank you to Brainy Quotes for the extensive list of Mark Twain quotes I cherry picked. Many blaming fingers have been pointing at eBooks for driving Borders into bankruptcy. I think eBooks are falsely accused. 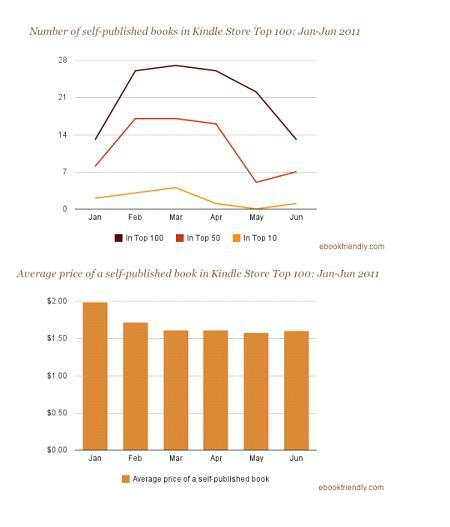 eBook’s did not really take off in popularity until late 2010-early 2011 but Borders has been struggling for years. That move happened in 2001 when it was about all about printed books sales–Nobody was taking eBooks seriously back then. Kindle did not even launch until 2007. 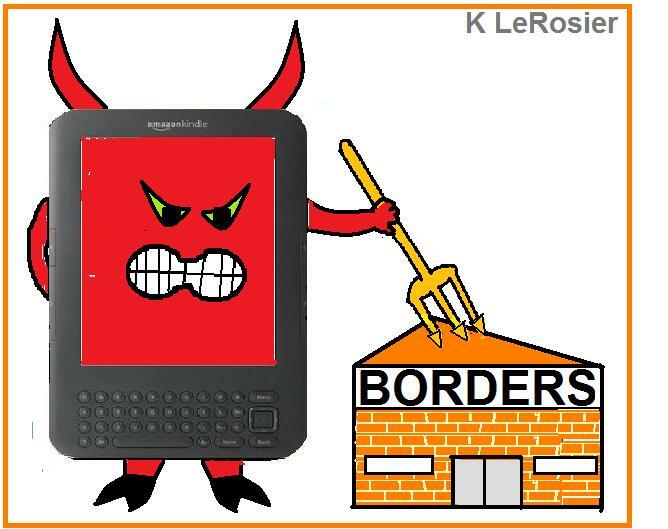 Bad Business Decisions Killed Borders Not My Kindle or eBooks. When asked about the fate of Barnes & Noble, Davidowitz said B&N faces an uphill battle but, “I don’t believe in inevitable things because I have seen a lot of great changes done in the retail business.” He said to survive B&N and other business have to “be paranoid enough to embrace change” and “listen to the customer.” He believes physical bookstores are not going away but there will me much less of them. in Amazons Kindle Associate Program. I can not become an affiliate because I live in the Land of Lincoln and Crooked Politicians & Lobbyist (Illinois State Government rated #2 in a Most Corrupt State Government Study.) Amazon has been forced to cancel the contracts of thousands of fellow Illinois bloggers who were already part of the Associate program. The contract cancellation letter Amazon sent Illinois Affiliates is copied at the bottom of this post. Associate Programs in Colorado, North Carolina, and Rhode Island have been ended by Amazon due to similar disputes and other states are on the endangered list. 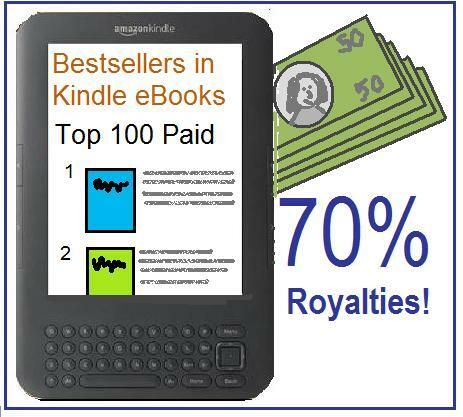 My Blog’s point of view–Me vs Pocket change to promote Kindle, Is Just the Tip of the Iceberg. The real issue is Consumers do not pay state tax on online sales generated through companies with headquarters outside of their state due to a loop hole–Distribution Center vs Business Nexus. Due to this States are losing billions in tax revenue and are tackling (picking on?) Amazon, arguably the business generating the largest sales tax loss. Sadly Amazons competitors are allegedly pushing this to give them a sales edge by hurting Amazons sales and swamping profit with legal fees–in the “short” term (which could be years in legal battles). At the same time Amazon is side-stepping this issue by shutting down distribution centers in States that pass tax laws to close the loophole, which in turns causes states to lose tax revenue and thousands of citizens lose jobs. It seems to be lose/lose for everyone, states.businesses, and consumers. Most likely, In the end, consumers will pay sales tax to states on all online sales. See articles at end of post to learn more about this issue. Bloggers and Readers who reside in Illinois and would like to write an email to our Governor about these tax changes click here. Writing might be a lesson in futility but at least you’ll get to speak your mind. Bloggers interested in Amazon’s Associate Program click here. For well over a decade, the Amazon Associates Program has worked with thousands of Illinois residents. Unfortunately, a new state tax law signed by Governor Quinn compels us to terminate this program for Illinois-based participants. It specifically imposes the collection of taxes from consumers on sales by online retailers – including but not limited to those referred by Illinois-based affiliates like you – even if those retailers have no physical presence in the state. We had opposed this new tax law because it is unconstitutional and counterproductive. It was supported by national retailing chains, most of which are based outside Illinois, that seek to harm the affiliate advertising programs of their competitors. Similar legislation in other states has led to job and income losses, and little, if any, new tax revenue. We deeply regret that its enactment forces this action. You are receiving this email because our records indicate that you are a resident of Illinois. If you are not currently a permanent resident of Illinois, or if you are relocating to another state in the near future, you can manage the details of your Associates account here. And if you relocate to another state after April 15, please contact us for reinstatement into the Amazon Associates Program. To be clear, this development will only impact our ability to continue the Associates Program in Illinois, and will not affect the ability of Illinois residents to purchase online at http://www.amazon.com from Amazon’s retail business. On July 18 Amazon announced the launch of Kindle Textbook Rentals. Students can save up to 80% off list prices. Tens of thousands of textbooks are available on Kindle for Fall 2011. Students can select rental periods between 30 & 360 days. A special advantage is after the rental period is over, Kindle highlights – “margin notes” will still be available and stored in the Amazon Cloud. With free apps a student’s rented Kindle textbook can be read on their computer, and/or most popular pads and reading devices, making the textbook available no mater what devise they pack on any given day. Think of the Back Problems that Won’t Develop in Lucky Kindle Freshmen! Buying books often transcends the students college budget. Textbooks can cost $100+ and the stingy resale money given won’t make a dent in the next semesters books. With up to 80% savings Students ought to be able to cover the cost of a Kindle and still save money this fall. College Students can Probably Have Their Texts and Eat too! In late summer I plan a follow-up blog post . I hope to obtain a few college students actual book lists. I will report on the availability of the textbooks on Kindle and their actual savings. If you’ll be a college student this fall and would like to share your book list and cost please leave a comment and email this blog when you buy your books. Amazon News Release: Students Can Now save up to 80% with Kindle Textbook rental.